This is the second article that Ms. Cielo has written on the subject of dendrochronology in Holland Township, NJ. Read the first one by clicking here! The Historic Preservation Commission of Holland Township, New Jersey, hired Oxford Tree-Ring Laboratory to date nine barns with dendrochrolology. This study has been funded in part with grants provided by the New Jersey Historical Commission. It was hoped that a study of this kind would answer questions related to ethnic settlement patterns. Holland Township borders the Delaware River and Upper Bucks County Pennsylvania to the west and south, the Musconetcong River and Warren County to the north and Alexandria Township and Milford in Hunterdon to the south and east. This location facilitated easterly migration from Bucks County, Pennsylvania. The barns chosen for the study were considered to be among the oldest remaining barns of their type in the township. An approximate construction date for each barn (based on the style of framing, presence of hewn and/or sawn timbers, the types of nails used in original materials and various other construction details) was determined prior to the study. The ground-level, swing beam barn is a single-level, side entry barn with three or four bays which typically includes a central threshing floor, haymow(s) and a bay to stable livestock with a hay loft above the stables. The smallest ground level three bay barn is 20’ wide x 31’ long, but 24’ to 26’ wide x 36’ to 38’ long is more common. The ground level four bay barns are about 26’ wide x 48’ long. The Standard Pennsylvania Forebay bank barn is a larger, two-level barn built into a bank for convenient access to the haymows in the upper level. The stables are in the lower level. The dated forebay barns measure 35’ wide x 55’ long; 32’ wide x 50’ long; and 30’ wide x 50’ long. The results of the dendrochrolology study are both exciting and disappointing at the same time; some questions were answered but others remain undetermined. Six ground-level, (three and four bay) swing beam, frame barns revealed the following construction dates: 1794, 1794, 1803, 1806, 1809 and 1812. Note: a 7th ground level barn dated 1787 was eliminated from the conclusion because the date was derived solely from three samples taken from floor joists. The upper framing was not sampled and suggests a later date when compared to the other dated barns. Additional samples may be taken at a later date. Conclusion – ground barns: The 1790s were the wild west of Holland Township. This was when the tenant farms, which had been leased by an absentee British landowner, were opened for private sale. The results of the dendro study indicate that all of the dated barns, were built after the associated farm had been sold and suggest that these barns were built as an improvement (or as an addition) to the earlier tenant barns. Note: The barn that was eliminated from the conclusion is located on a farm which did not sell until 1813, but since it post dates the Revolutionary War was likely built by the tenant (not the landowner) as an improvement to an earlier barn. We know that the tenant barns were frame (not log or stone) and that they were built by the British landowners for the tenants from an “account of the expenses of building a barn on the place leased to John Thomson” which includes the purchase of “2000 feet of weatherboards,” “15 days work …. cutting and hauling timbers,” “55 days board,” “32 meals at raising,” “3 gallons rum,” “blacksmith work for hinges and nails,” “work of carpenters £12.0.0,” “masons work,” “2000 Shingles,” etc. The question remains, what did the circa 1750 to 1776 tenant barn look like? Nothing has been identified from this period as of yet. The dendro study revealed that the earliest remaining barns were built entirely of hewn timbers and the rafter plates have double notched rafter seats. The earliest barn to be framed with single notched rafter seats dates to 1794 but there is an overlap; the other 1794 barn has double notched rafter seats. This indicates that framing details had begun to be simplified by 1794. The use of sawn braces and studs occurred by 1803 and the use of sawn rafters occurred by 1812. Three Pennsylvania Forebay bank barns revealed the following dates: 1806 (stone), 1821 (frame) and 1825 (frame). Conclusion – Pennsylvania Forebay barns: According to a late 19th century account, in 1806, Phillip Burgestresser (1778-1841) who was of German ancestory, moved to Holland Township from Tinicum Township in Bucks County, Pennsylvania and built a “nice brick house and good barn far superior to that of his neighbors.” This quote suggests that the “far superior” barn was a Pennsylvania Forebay bank barn and that this barn type first appeared in Holland Township in or slightly after 1806. The date of 1806 for the earliest remaining stone Pennsylvania forebay barn supports this conclusion. (Note: Barn historians formerly assigned a circa 1820 to 1825 date for the migration of the Pennsylvania Forebay barn form into Northwest Central New Jersey). The Pennsylvania Forebay barn type migrated into this area of New Jersey from upper Bucks County, Pennsylvania. That study also shows that a much lighter style of timber framing migrated along with the forebay barn form. Settlement from Upper Bucks County into Holland Township began by about 1750 or earlier. Early communication between Upper Bucks County and Holland Township was facilitated by the presence of a ferry by 1741 and the transportation of iron related resources to and from Durham Furnace which began production in 1727. 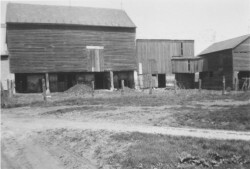 The fact that the Pennsylvania forebay barn type did not appear in Holland Township until the first decade of the 19th century suggests that the barn type did not reach upper Bucks County until the first decade of the 19th century. However, the Federal Direct Tax of 1792, lists a “35’ x 60’ stone barn” in Durham Township, and a “30’ x 50’ stone barn” in the neighboring Township of Nockamixon which suggests the presence of the larger forebay barn type in Upper Bucks County by the end of the 18th century (further research in Bucks County is required). If this was the case, what delayed the form from crossing the river when communication and transportation was so prevalent? The dendro study shows that both the smaller ground barn and the much larger Pennsylvania Forebay bank barns were built concurrently for awhile. It would be nice to accurately date a few of the younger ground barns to see how long the smaller barn type persisted. Reused components remain in several reconstructed barns and are sometimes in an addition to a ground barn. These include rafter plates with double notched rafter seats, posts with a flair at one end reused as a plate, as well as whole sections of reused framing. These fragments may be dendro dated in the future with the hopes of finding some evidence of the type of barn construction during the 1750 to 1776 tenant period.